If you are a bride or groom who suffers from social anxiety disorder, the idea of giving a speech at your wedding may be causing you to panic. Don't worry! You can get through that speech, and even shine on your special day if you just take some time to prepare. First, if you haven't already been diagnosed or received treatment for your social anxiety (such as cognitive-behavioral therapy and medication) add that to the top of your list. However, you probably have limited time between now and the wedding and need to know how to get through that speech without the help of outside interventions. Below are some steps you can take to help calm your nerves about giving a speech at your wedding. Make sure that you are familiar with the reception hall before the wedding. Find out where you will be seated and where the microphone and podium will be. Becoming familiar with these surroundings early on will make you more comfortable when the big moment comes. Although it may be tempting to write out a speech word for word, unless you are very experienced in public speaking there is a risk that you will come across as stiff and wooden. Instead, carry point form notes with you to the podium and try speaking in a conversational tone. 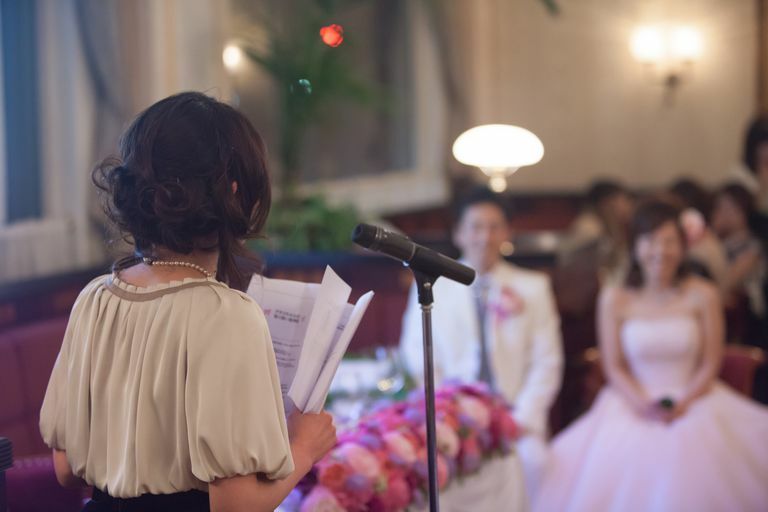 There is no substitute for lots of practice when it comes to public speaking, and a wedding speech is no exception. By practicing what you are going to say in advance, you will gain confidence that will carry through to your big day. Athletes have used this trick for years — by imagining yourself relaxed and confident while delivering your speech, you train your body to respond in the same manner. Make sure to engage in regular exercise leading up to your wedding. Regular exercise helps to alleviate stress and anxiety. While it is never advisable to consume large amounts of caffeine, those who suffer from social anxiety should try to avoid it altogether. Remember that in addition to coffee and caffeinated soft drinks, tea and chocolate also contain caffeine. Before you begin speaking at your wedding, acknowledge that you are nervous. Simply admitting to having a little stage fright often goes a long way to overcoming performance anxiety. Instead of scanning the room and worrying about what others are thinking, focus on what you are saying. Allow yourself to be swept away by the moment and notice how your anxiety tends to be swept away as well. Find out where you will be speaking. Bring point form notes only. Get regular exercise and avoid caffeine. Admit you are nervous and then focus on your speech. While many people may feel nervous giving a wedding speech, you might actually find that you enjoy it! At the very least, feel proud that you took the time to try and overcome your fear to make this important contribution to your special day. Years from now your spouse won't look back and remember your fear and anxiety—only the thoughts that you shared. University of Tennessee at Martin Counseling and Career Services. Public Speaking Anxiety. Accessed February 25, 2016.